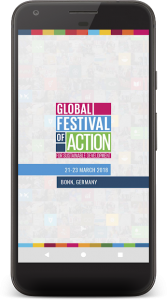 All Festival-goers have access to the SDG Global Festival of Action mobile app! Download (iOS / Android) the app ahead of the event and have access to networking features to make the key connections needed to further SDG Action, create your own agenda to map the experience that is right for your needs and stay up-to-date with the latest program news! Fill your profile and start connecting with the SDG community and get ready to join us in Bonn!